While working for various potential contractors, the opportunity was extended to create new marketing materials for Arc Archer Lighting. 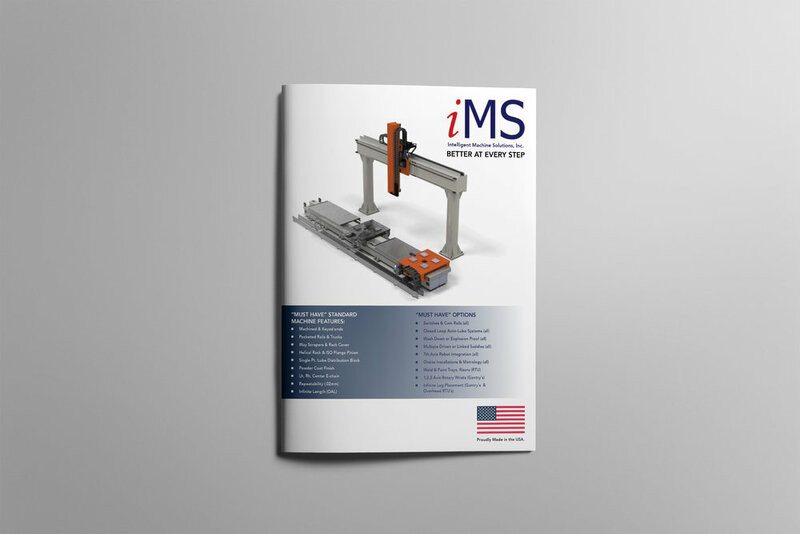 This brochure was one piece to come from the venture of improving and providing materials needed for physical marketing. Client Work. iMS in the course of beginning their rebranding requested sales document to get out in circulation prior to the rest of the branding process. They requested clean, simple, solid, language to be used in the design, and that their products and their connection as the only USA manufacturer in their field to be prominent. The cover is an example of this in action. A clean, simple form, with emphasis on clean edges, focus on type, and on their product. The goal will be to use this as a first stepping stone in developing a strong, unique, branding language that helps them compete on a global level. Contracted via 2 Fish Co. This logo was created for a partnership of Southwest Michigan First for a program of Catalyst University. A Client Logo package designed for a start up video film and production company based locally in West Michigan. The design goal of the client was to integrate the letter form "Q" with some symbolism or imagery related to the filming process while focusing on the brand name. While contracted through 2 Fish Co. Marketing and Communication firm, I have worked on several editions of the publication, 269 Magazine put out by the client, Southwest Michigan First. The publication is worked on by multiple designers and writers and photographers, and overseen by 2 Fish Co. The design work entails gathering the supplied articles, and photography and implementing them in a meaningful way depending on the thematic needs of the issue or content of the article. In the first two editions, additional work was done by the team to set style guides and templates that could be worked off of in the future. Recently I decided it was time for a redesign to better represent my work and more importantly who I am across all mediums and future pursuits. The logo is designed around the concept of historical heraldry and was built sticking to the rules and traditional builds as much as was possible when constructing a logo built around my full name. All symbols are representational symbols that have connections to my name, and both sides of my families' surnames. The logo presented was a redesigned concept done as a side project. I alway enjoy experimenting with reproaching logos and symbols that already exist. The goal was to approach the logo in a unique way and try out influences from a different region than that has typically been used in previous logos here. Based on a stamps or seal design, the single width line work portrays the same scene as the preexisting logo while approaching it in a clean geometric method for a new period rather than the pre-existing 80-90's design language. Primary focus was on on the line weights, and maintaining the imagery of the former logo while refreshing a symbol that would have wide applications. A Vector Map print of the town Grand Haven, MI. built with the building silhouettes to create the map, boundaries, and roads through negative space. The goal was to experiment with how we see maps and also enjoy taking a look at my home city in a new way that was both an illustration and accurate to the geographical range and layout of land and roads and parks and building locations. I alway enjoy experimenting with reproaching logos and symbols that already exist. 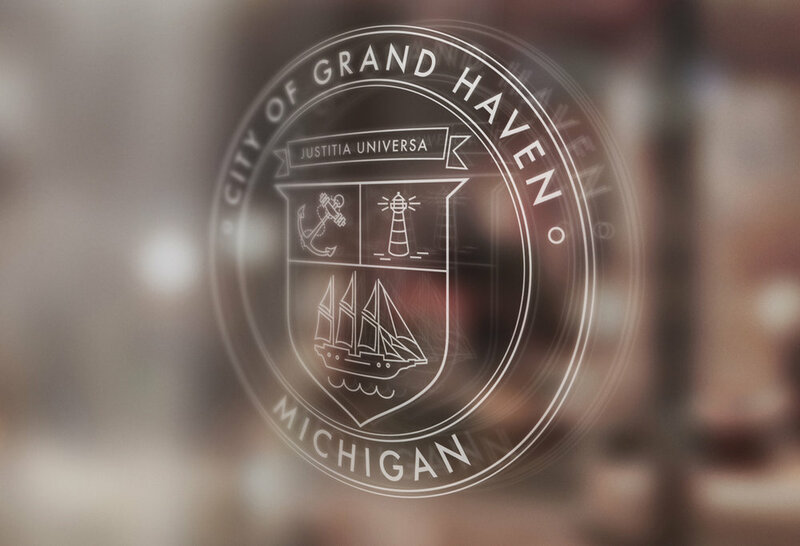 The logo options are similar to the pre-existing crest the city of Grand Haven holds. After researching the different symbolism and placements of the heraldry crests, I rearranged and reproached the crest of Grand Haven. Primary focus was on correcting hierarchy of symbols based on heraldry tradition, on the line weights, and maintaining the history of the area while refreshing a symbol that would have wide applications. Self Published book, by local author from Jackson, Michigan. Illustration, layout, and publishing logo were provided. The request was to give some imagery based off an selection from the beginning of the book. A hand drawn image was suggested and chosen to convey the personal narrative and approach to how to connect with people and share stories. The logo presented was a redesigned concept done as a side project. I alway enjoy experimenting with reproaching logos and symbols that already exist. The logo took the same base imagery the original logo is built on, but approached it in a more abstract and geometric way. The goal was to use shapes and movement of the forms that conveyed the goals and services of a boat propeller shop as well as using color in a minimal flat method to add to the idea of reliability as well as water. Logotype redesigned for Praxis Church located in Michigan in conjunction with Northmoor Conference Center. A simple redesign sticking to the previous logotype design with updates to color and font used to maintain consistency in their branding. Book Cover design for a Spring Arbor University professor. Self published collection of oral presentations of Biblical stories. The request was for a very simple layout and design. The goal and emphasis was to maintain a traditional bible feel using a textured cover similar to classic Holy Bibles. While maintaining the traditional feel the symbolism with the spear was a goal to draw the content, spoken word accounts of bible accounts, to the cover to convey the content. Undergraduate Design Portfolio Logo Redesign. 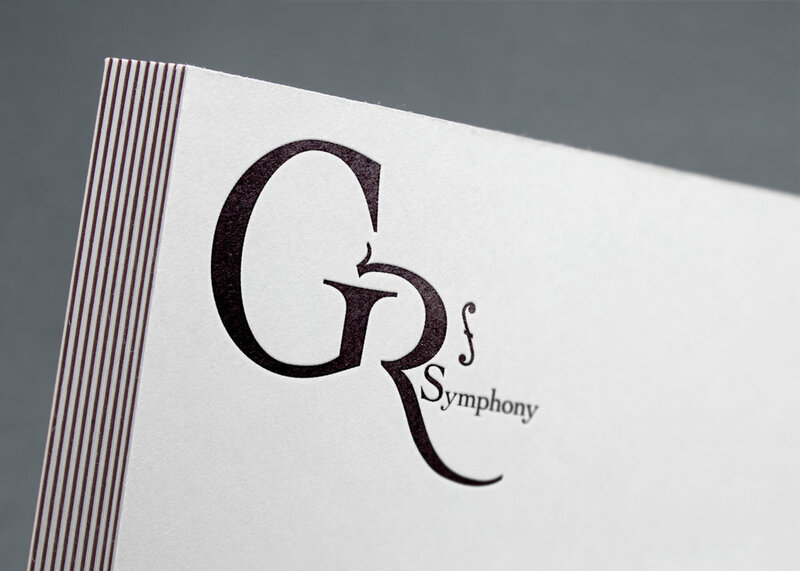 The conceptual logo redesign was to create an elegant, modern, yet clean design for the symphony. It was an experiment in typography and logotype work, with a subtle image of a violin lending itself to the letter forms in Grand Rapids. Conceptual logo for a local coffee shop in my home town. The coffee shop has held a very timed logo reminiscent of late 80's and 90's design language and similarity to the tv famous coffee shop from "Friends". The goal of the redesign was to clean up the logo to a very clean, minimal, modern language for the logo. The design was created with one typeface family and only type elements from the name of the coffee shop, Coffee Grounds. Logo set design for church plant youth group in the greater Grand Rapids area. The client request was for a clean, modern, appealing to a young audience style. The resulting logo was created to meet that, and the concept of the name for the youth group, reaching out to others, the community. It also was desired that the foundations of Christian beliefs be included, so a subtle symbolism was created in the "E" form a book, or more specifically the Holy Scriptures. Best in Show for Design in a juried show for 2012 fall at Spring Arbor University. A book jacket redesign for the Frank Herbert Novel, Dune. The goal of the illustration is to explore the connection of the hostile world and the residents, especially the main character and his journey into and with the world and the sands that cover the whole planet. This was approached through tying the imagery of the sand through his cloak not just around his feet. Book Jacket Design for poem publication from the Spring Arbor University English Department. The request was for a very clean aesthetic with a typographic element conveying generally the subject of the poems and writings collected. The motif was the symbolism of the term crossing over in literature and what it often can reference or portray.